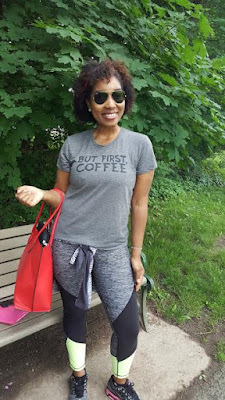 I was in the park taking a walk last week, and I ran into my friend, Rachel. Rachel is a fellow mom, and also a major force in brand marketing, vlogging and blogging at Truly Rachel about motherhood, fashion, lifestyle and DIY. To say the least, Rachel is dynamic. Rachel is high energy. It's true, she’s smart, but I know one of her secrets to being so successful and healthy. Take a look at her shirt and you’ll know too. Rachel’s all about good coffee and lots of it. In fact, I think it’s fair to say that she and I are pretty evenly yoked when it comes to sipping the dark brew and enjoying the roasted green bean. Fortunately, it’s making us healthier. 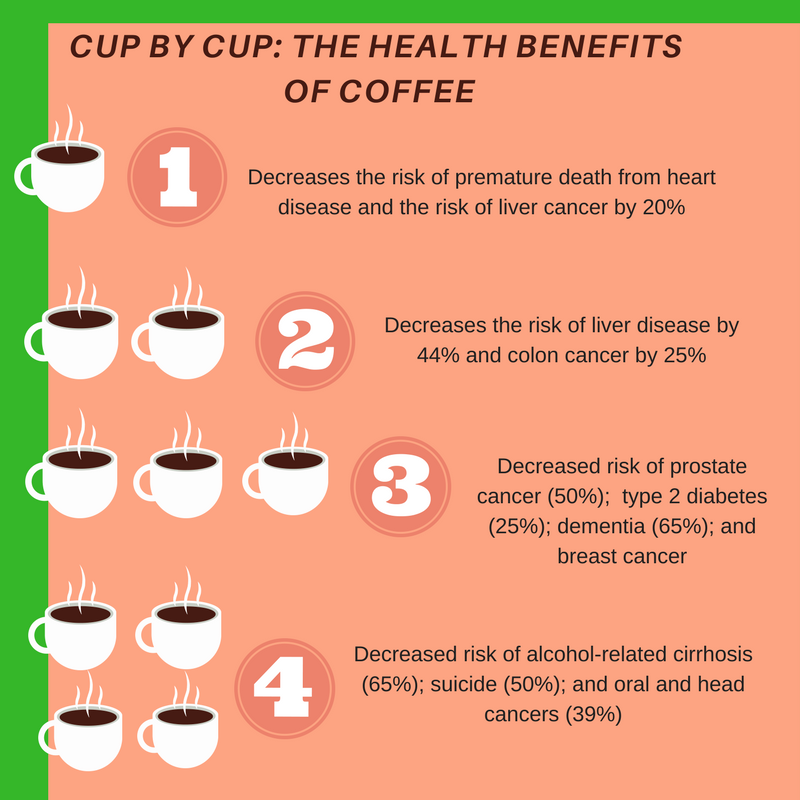 In fact, coffee is now known to decrease the risk of various types of cancer, in addition to cirrhosis, Alzheimer's disease. diabetes, and even suicide. I’ve put together an infographic showing how many cups of coffee you need to drink in order to enjoy certain health benefits. Next up on this blog, I will be discussing new research showing the link between coffee and a decreased risk of hepatitis C. So I'm going to keep this short, because I’ve got to get back to work. I have reflux, which I successfully control strictly through dietary and lifestyle changes. These changes include no wine, reducing greasy and fatty foods, etc. It also includes, in the first few months, eliminating coffee and black tea, among many other reflux-inducing foods and beverages. I had no trouble at all eliminating so many things I'd loved all my life, knowing that I could gradually reintroduce a few of them (chocolate) and others not at all (wine.) I thought that wine would be the hardest thing to live without, but it wasn't. It was coffee! I simply love it. So for the first few months I followed the draconian lifestyle diet, and enjoyed true relief. After around 6 months, I was able to add a cup a day of coffee to my diet with no ill effect. YAY! I learned that the darker the roast, the less acidic the coffee. I also learned that cold brew is gentler on the reflux and also delicious. So I may not be able to have the acidic fruits, like peaches and tomatoes, that I used to love, and I may have to have a cup of chamomile tea instead of a lovely glass of malbec or merseault, but as long as I can enjoy a delicious cappucino or cold brew with coconut milk every day at work, I'm fine with that. (the book that helped me so much is "Dropping Acid: the reflux diet and cookbook" (or some title like that) by Dr.Jamie Koufman and Dr. Jordan Stern. It truly helped me. Hello Fran, Jack and Coffee Benefits. Thank you for your comments! This place looks familiar perhaps. This dreamy location meets real glam at the hands of the manager. It’s sophistication with a dash of bliss. At our visit to these rental spaces for parties there were several highlights.